Opinion: SFO budget is just not enough. Lessons learned from Asil Nadir guilty verdict & his two parrots. Last week saw the jailing of Asil Nadir for 10 years after the collapse of Polly Peck. It is the outcome of an investigation which has been going on for over two decades with a lengthy nineteen year interlude when Mr. Nadir did a bunk to Northern Cyprus and eluded UK authorities. Northern Cyprus has no extradition treaty with the UK. Polly Peck lived on in Northern Cyprus – Nadir named two pet parrots Polly and Peck to keep him company. In 2010 the case revived when Nadir voluntarily returned to the UK on a private jet to clear his name. Presumably he had tired of the company of his parrots. The case had it all. A charismatic and high profile defendant and a rags to riches story in the shape of Polly Peck – a small textile company which was to become the stock market darling of the 80’s. It spectacularly failed after an SFO raid revealed that the Polly Peck success was no more than an elaborate facade. Investors lost nearly two billion pounds (when a billion really meant something) thousands were made redundant. Asil Nadir was the UK’s Gordon Gecko in the 80’s. Fast forward to 2012 he was our Bernie Madoff, except Nadir actually did make off. For 19 years. It turned out that due to a mistake Nadir did not breach bail conditions when he fled the UK – due to a technicality no-one spotted he had not surrendered to bail. An arrest warrant for breach of bail conditions was therefore invalid. Another SFO blunder from years gone by. Nadir had the potential to be the final nail in the coffin for the SFO, in a case where the documents had to be reviewed by officers in protective clothing (microscopic bugs in the ancient papers gave reviewers skin conditions) and key witnesses were long gone. Nadir gambled the SFO would have a hard job to convict. And yet, if Tchenguiz is the SFO’s low point this year then this could be the SFO’s high point. In the same way the former Director has had the finger pointed in his direction for Tchenguiz he deserves credit for the part he played in getting this one over the line. The trial began in January but the preparations have been ongoing for the last two years. David Green QC, the new director, also deserves credit. His directorship has presided over a key period of the actual trial. Apart from being a ripping yarn what does Nadir tell us? Polly Peck was a massive stock market fraud and the key protagonist had to be brought to book. It was the sort of case that the SFO was made for. 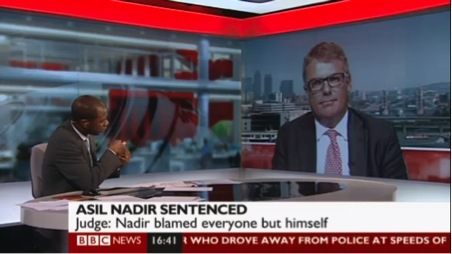 Last week Barry was asked to write a piece for City AM (A London morning daily on Nadir and the SFO), and also commented in various media, ranging from the Financial Times to the Daily Mail (and also made it onto the telly speaking about the conviction – pictured). The central theme, today the SFO simply does not have enough money. The SFO is as relevant today as it ever was. If not more so. At a time when other financial hubs, like New York, are keen to use a perceived failing in regulation in London to promote themselves, the UK would be foolish to underfund or create uncertainty surrounding the future of the agency. Yes it must be properly managed. Yes it needs to be improved. But neither of these criticisms mean that we should throw the baby out with the bathwater. The Nadir case underscores the importance of the agency and highlights the need to properly fund it. Prosecuting Nadir reportedly cost over £3 million. Put another way, 10% of the SFO’s annual budget of c. £30 million has been spent on one prosecution.